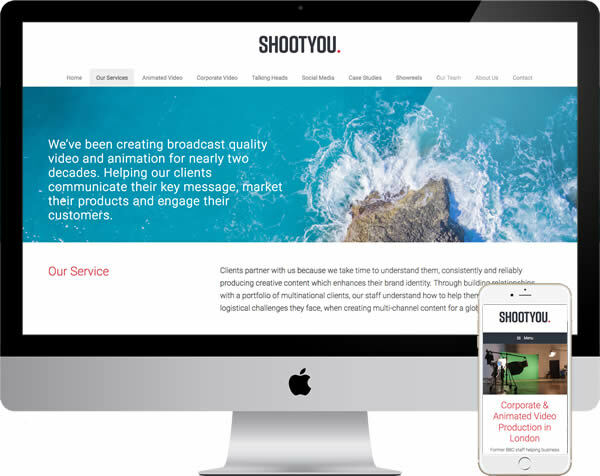 Brief – Shoot You produce real world and animated video for corporate clients. We provided an interim website to meet urgent needs and device compatability, then produced the final version. Beyond a web presence to suit their brand and customers, Shoot You wanted to work more effectively with search. Placement in search results did not reflect their position as an industry leader. Ensuring the website illustrated their work should also be a priority, along with segmenting different skill areas. A selection of the videos they produce would lay at the heart of the new website. Technical & Search – Our client had their web presence spread across several domains. Apart from building strength in one place being a better approach, their internal time limitations encouraged thin content. We created a plan to amalgamate all domains, into one, smaller website. This would be better appreciated by Google and managing a single website help them create better quality content. At the same time, a number of technical errors impinging on search could be dealt with. The ultimate aim, to build a clean, search friendly site, which would be more comprehensive and accessible. Design & Build – The interim stage allowed for in depth testing and data collection on user reaction. The final design focus would be on clarity of information and ease of use. Video related websites often take a “wall of video” approach, or have auto playing video. Neither are appreciated and lose more clients than they gain. We built for speed, whilst still giving clear access to a range of videos. Although more were available, the design promoted videos potential clients should watch, guiding their choice. The brand and ethos of their potential supplier woven into the viewing experience. Outcome – User data reflects how much happier people are on the website. A place which is found by more interested parties, due to a notable improvement in search performance. The creative talents of our client are still reflected by their website, in a friendly, practical way. A balance which allows users to access information and reach decisions. By all means see more examples of our work, or if you came direct to this page, try the options in our introduction to web design. You are equally welcome to get in touch, to discuss your own web project.